COG is always keen to hear from talented and experienced choral singers. Why not consider joining our chorus and getting to know a wide range of interesting and less familiar works that form an important part of our repertoire? Chorus rehearsals are held in central London, normally over the five weeks before a performance, with two evening rehearsals a week and one all-day weekend session. Please note: this contact is solely for applications to join the chorus. COG does not hold general auditions for soloists. Under a professional leader, COG has one of the best amateur orchestras in the country. Membership of the orchestra is by invitation. We are always on the look-out for high quality players – especially if you play a brass instrument or the double bass. In addition to its opera performances the orchestra visits Salisbury twice a year to play with the Salisbury Musical Society, and there are occasional other concerts. COG receives no public subsidy. 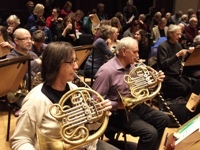 The Group survives by a combination of box office income, fees earned by the orchestra for outside engagements, subscriptions and some welcome donations.